Val Lewton, a famous RKO Radio Pictures producer, redefined the horror genre with low-budget, high-box office films. Now available are nine of these horror classics on DVD in the all new Val Lewton Horror Collection. Exclusive to the collection are a new documentary on the producer and 3 of the 9 films. 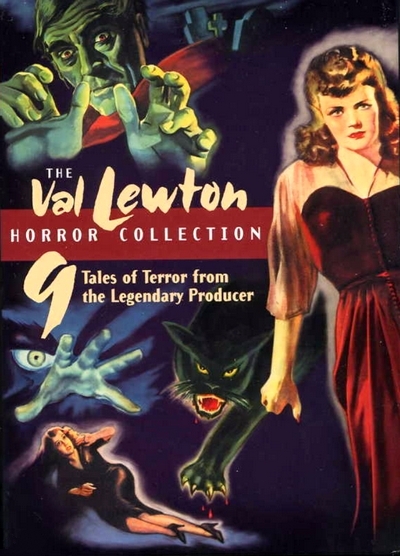 Val Lewton's name is synonymous with the subtlest, most mysterious brand of horror filmmaking in Hollywood's golden age, and the nine horror classics he produced at RKO between 1942 and 1946 constitute the most remarkable cycle of creativity in B-movie history. Before becoming a film producer, the Russian-born Lewton was a prolific writer of pulp fiction, nonfiction, and a couple of pornographic novels. He also worked for years as assistant to David O. Selznick, a legendary producer with a distinctive personal signature--and a flair for grandiosity Lewton himself never emulated. It's ever so revealing that, on Selznick's Gone With the Wind, it was Lewton who came up with the idea for the famous rising shot of the Atlanta railyard filled with Southern wounded, with the Confederate flag streaming above--only he idly proposed it as a joke, never imagining that anyone would actually film such a spectacularly ambitious scene. Cat People / Curse of the Cat People – Cat People, directed by Jacques Tourneur (Out of the Past, I Walked with a Zombie), is the trailblazing first of Lewton’s nine horror classics. The film stars Simone Simon portraying a bride who fears an ancient hex will turn her into a deadly panther when she’s in passion’s grip. Simon returns in The Curse of the Cat People, a sequel that has become a landmark study of a troubled child that proved to be so astute it has been used in college psychology classes. This gothic-laced mix of fantasy and fright marks Robert Wise’s directorial debut. I Walked with a Zombie / The Body Snatcher features two great Val Lewton classics which are based on literary sources. Using the gothic romance of Jane Eyre reset in the West Indies, director Jacques Tourneur and Lewton created I Walked with a Zombie, noted for its overriding terror of the living dead. Frances Dee plays the nurse who witnesses the strange power of voodoo. Boris Karloff, the most celebrated star in the history of screen horror, stars in the title role in the Lewton adaptation of Robert Louis Stevenson’s The Body Snatcher, directed with subtle calculation by versatile young Robert Wise. A doctor (Henry Daniell) needs cadavers for medical studies and Karloff is willing to provide them – one way or another. This film includes Karloff’s famous scene with fellow horror icon Bela Lugosi. The Leopard Man / The Ghost Ship, two more gems from innovative producer Val Lewton in which he returns to the theme of living dead to instill horror. In The Leopard Man, an escaped leopard provides the catalyst for a foray into fear in which castanets clack wildly, a cemetery is a rendezvous for death and love, and a closed door heightens rather than hides the horror of a young girl’s fate. It’s the third and final teaming of producer Lewton and director Jacques Tourneur. Director Mark Robson (Bedlam, Peyton Place) helms the brilliant nautical thriller The Ghost Ship. Richard Dix (Cimarron, The Whistler series) plays the sinister captain whose port of call may be madness. Isle of the Dead / Bedlam - Boris Karloff headlines these two atmospheric works filled with producer Val Lewton’s trademark mix of mood, madness and premeditated dread. In Isle of the Dead Boris Karloff shares a quarantined house with other strangers on a plague-infested and perhaps spirit-haunted island. St. Mary’s of Bethlehem Asylum in 1761 London provides the setting for Bedlam. Here, Karloff gives an uncanny performance as the doomed overseer who fawns on high-society benefactors while ruling the mentally disturbed inmates with an iron fist. Mark Robson, who edited three films for Lewton and directed five, guides both of these films. The Seventh Victim is Val Lewton’s stunner about a Greenwich Village devil cult where six people have broken the clandestine group’s code of silence. The same six appear to have died as a result. Now a new member of the group has gone missing. Will she meet the same fate? Kim Hunter debuts as a schoolgirl whose search for her vanished sister unearths an urban lair of devil worshippers. Mark Robson directs the first of his five Lewton films, bringing dark foreboding to moments that include a much-noted pre-Psycho shower scene and a shocker of a subway encounter.